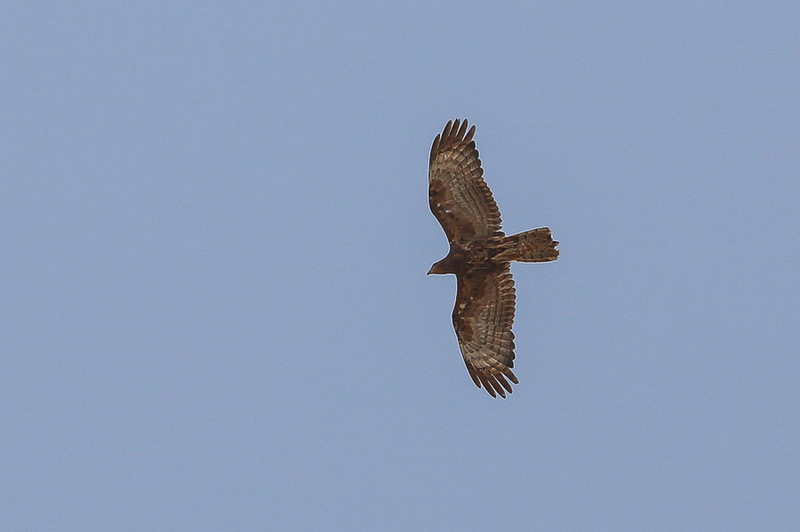 Crested Honey Buzzard is regarded as a scarce passage migrant and winter visitor to Saudi Arabia with almost all records from the Eastern Province region, all within the last two decades with no records from Saudi Arabia before 1981 (Jennings 1981). There is only one documented summer record from the country of an adult male at Dhahran, Eastern Province, 30 July 2011 (Babbington 2012). The species is not documented as occurring in the south-west of Saudi Arabia. On 5 July 2013 Phil Roberts and I visited Tanumah Park. I have already posted details of what we saw there including a photograph of a bird we thought was a European Honey-Buzzard. Yoav Perlman kindly dropped me an e-mail saying the bird looked a little odd and had features of both European Honey-Buzzard and Crested Honey Buzzard and suggested I contact one of the world authorities on the birds. As I know Andrea Corso I sent him an email and he very kindly replied with the following information.The bird was identified as a 2nd calendar year from the pale cere, the dark‘fingers’, the tail pattern and the pattern of retained secondaries and is a female from the moulted primary pattern, the pale iris and the wing and tail shape. It was moulting its inner primaries with the innermost primaries new on both wings, while P5 was missing (possibly growing or still to grow) giving the bird a wing formula like in European Honey Buzzard Pernis apivorus. This is a very interesting record as it is only the second documented record of the species in summer in Saudi Arabia and is in a region more than 1000 kilometres away from the Eastern Province where the previous summer record occurred. Unfortunately, as all pernis migrate with active wing moult, it is not possible to know if the bird summered in the region was an early migrant. Another interesting point about this record is the species is also not documented as occuring in south-west Saudi Arabia although Rob Tovey (pers comm) informed me of one record from the southwest at Najran, Najran Province, an adult male December 2012 seen by Lou Regenmorter and another bird, a second calendar year male February 2012 at the same location, which was not positively identified but looked promising for the species. This makes this record only the second or third documented record from SW Saudi Arabia. One of the good things, in my opinion, of having a blog is birders with more knowledge than me can correct identification mistakes. They normally, like Yoav did, do so in a very kind and respectful way. Then I can get advice form other authorities and try to broaden my knowledge of the birds identification features and their status in Saudi Arabia. 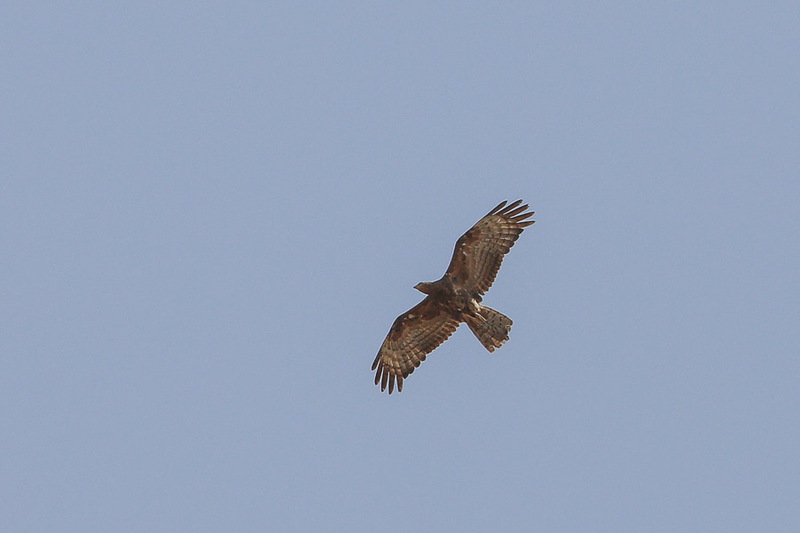 I would like to thank Yoav Perlman for giving me a ‘heads up’ that this may be something other than a European Honey Buzzard and Andrea Corso for taking the time to look at the photos and correctly identify the bird. I would also like to thank Rob Tovey for supplying me with data of the two south-west Saudi Arabian records. An interesting and instructive bird Jem - it's good to have instant access to advice via t'internet. It certainly taught me to look more carefully and not just go on the standard 5 (EHB) or six (CHB) primaries fingures.